Canter’s, a delicatessen based in Los Angeles and about which I have previously spoken, operates an outpost in Las Vegas’ Treasure Island Casino. While in town sometime back, I made it a point to stop by to see how the sandwiches on offer stacked up against the ones in Los Angeles. 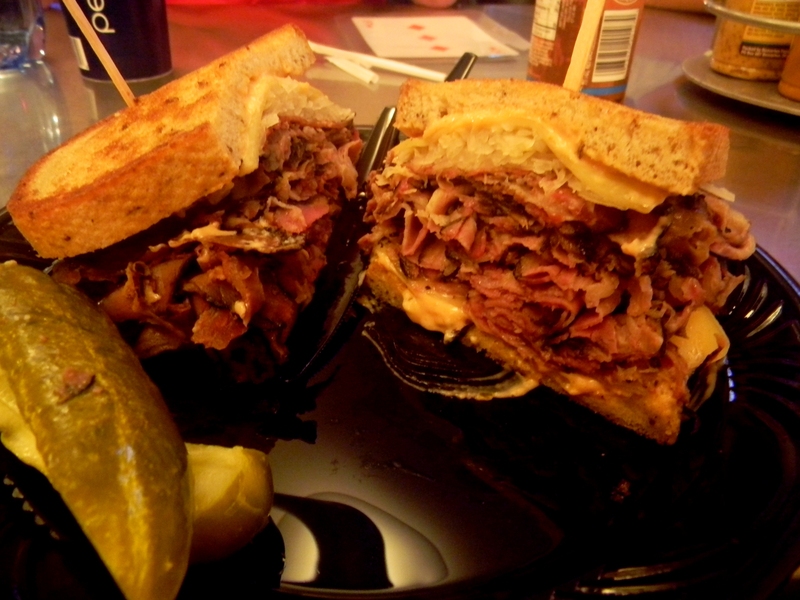 The Reuben, I am happy to report, remains a song of the heart, a pile of deliciously salty pastrami and moist sauerkraut. The sandwich itself is just as good, but, as you might expect, the atmosphere is a bit lacking. The Canter’s in Las Vegas is just stuck in a corner of the gaming floor, the floor’s jarring shift from hectic carpet to checked tile making it appear exactly what it is, a secondary appendage, an afterthought. It suffers from that permadusk that so pervades any and all casinos, you order from one window and grab your food from another, and there’s no one to top up your supply of pickles. In short, it lacks charm in just about every way something can lack charm. But it’s in an area that’s light on really high-quality sandwiches, so it’s still well worth your time. The same cannot be said, sadly, of all of the sandwiches. The Eddie Cantor’s Delight, for example, is an ostentatious number that would be a towering failure if they even bothered to stand it up. Stages Deli, another venerable institution prone to missing the mark, at least made a display of their sandwich. Compounding the sin that is serving a sandwich with a fork, the Cantor’s Delight comes lying prone, having already surrendered to its faults. It’s not that you can’t pick it up, turn it right side up and go at it, it’s that they’re telling you you need to. The combination of pastrami, corned beef, turkey, ham and swiss cheese isn’t a terrible idea, and they’re even basically in proper proportion, but the sheer size of it renders the whole thing nearly useless. There’s no way to attack it that gets everything at once, and so you’re really left eating a couple of different sandwiches, a bite from one then a bite from the other. There’s a time and a place for that, but it isn’t when you’ve ordered a single sandwich. Eddie Cantor surely made quite a mark in the world of music, and it’s a good thing he did. His contributions to the world of sandwiches aren’t worth two dimes, be they marching or not. 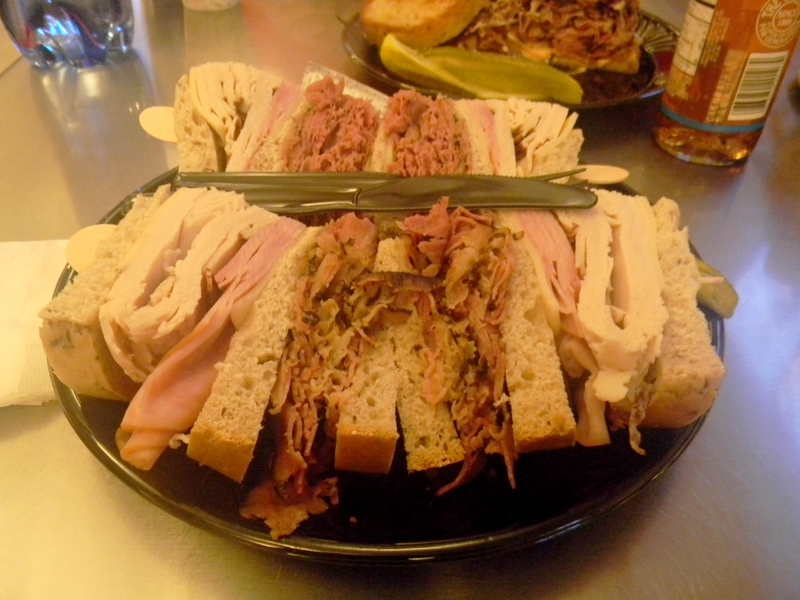 This entry was posted in Sandwich Reviews and tagged Cold Cuts, Las Vegas, Reviews by Pete, Sandwiches I Have Eaten, Sandwiches Made For Me by Pete. Bookmark the permalink.